Selecting your self build house designer. The house designer you choose will be taking your ideas and turning them into solid plans for your future home. It is important to get someone who you like, trust and who understands you as a client. There are numerous options when thinking about choosing a house designer, each with their own benefits. As we’ve mentioned previously, as long as the design requirements for planning permission and building regulations are met, then basically anyone can have a go. Perhaps the best known and generally the most expensive option is the architect. The cost reflects their high levels of education and experience and with at least seven years of training required to become one, it is easy to see what you are paying for. If you are keen to keep costs low and are looking for a fairly standard house then an architect might be an unnecessary expense. If, however, you want a great design or something out of the ordinary and you require the professional input of an architect and are willing to pay for it, then they could be the house designer you are looking for. You can check an architect’s credentials by contacting the Architects Registration Board (ARB) that all qualified architects must be registered with. Many architects achieve ‘chartered’ status by joining the renowned Royal Institute of British Architects (RIBA). The RIBA website offers advice and information on finding, engaging and working with architects and has a searchable directory of its members so you can find one that fits your specific needs. For self build specific design services, you could have a look at ASBA, which is a network of architects who specialise in the design of one-off homes, extensions and refurbishments. A more affordable choice of house designer is to use an architectural technologist. Their profession focuses more on the technical aspects of building design and construction, as opposed to the conceptual. Although they generally work alongside architects, many now operate individual practices and are worth approaching for self build work. Visit the Chartered Institute of Architectural Technologists (CIAT) website for more information and to search for designers in your area. Building surveyors carry out a lot of smaller scale design work such as houses and extensions and are often a good value option as a house designer. Visit the Royal Institute of Chartered Surveyors (RICS) and use the advanced search function to find surveyors who offer architectural and design services in your area. There are a whole host of other individuals from a range of backgrounds who offer house design services. Searching the internet, local directories or the Yellow Pages for architectural services should reveal those in your area. If you plan to use someone who is not formally trained or accredited, spend a bit more time reviewing their references and previous work to satisfy yourself of their abilities. If you have a burning desire to design your own home, then there really is nothing stopping you. There are plenty of ‘how to’ books available on home design and a range of home design software to make life easier. Inspiration is available everywhere you look and magazines and plan books are a good source. 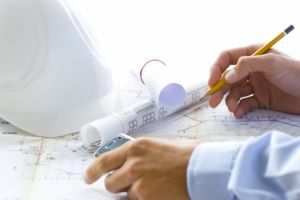 If you are considering doing your own design then you may still want to get some professional help when it comes to the more technical drawings required for building regulation approval. Whichever route you choose remember that good design is invaluable and getting it wrong can be a costly mistake. If you don’t have any idea of who you might use as your house designer and are selecting one from scratch, then it is advisable to carry out a selection process to review several and find the one you have the most confidence in. Use the links above and other search resources to compile a list of designers that might fit the bill. Although you don’t necessarily need to use a local designer they’ll have local knowledge and will probably know the planners (and their particular concerns). If they have websites, have a look at them. Give them a call and discuss what it is you plan to do and let them explain their background, services, terms of contract and fees. Having spoken to a few you will be able to rule some out and will probably have a couple of favourites. Decide on your three potential designers and arrange to meet them in person, preferably on your plot. Ask them to bring along examples or details of their previous work and some references for you to follow up. As well as giving them a chance to see your plot and allowing you to take their examples and references, you can have a better chat about your self build and get a feel for which one is understanding your needs. If none of them are, don’t be afraid to go back to the drawing board (excuse the pun!) and select another three to meet. Make sure to follow up the references you have been given as previous clients will be your best source of feedback. You should have enough information to compare them and decide on which one will be best suited as your self build house designer. As we discussed in our section on buying land, it is useful to appoint a designer early on as their experience and input can be very helpful during your plot search. When you’ve found the house designer who meets your requirements and understands your needs you can get them signed up and your design underway. Have a look through the rest of The Self Build Guide for more information on all aspects of building your own home.